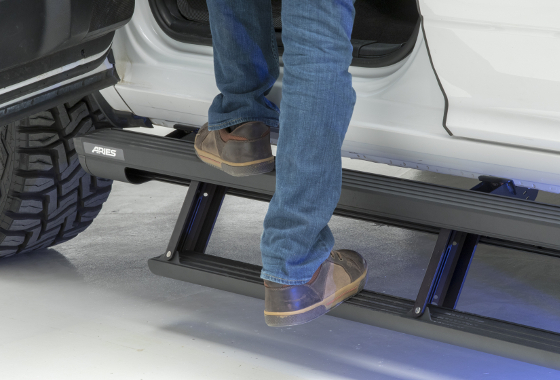 Unlike any other power running boards on the market, ActionTrac™ boards feature a step-within-a-step™. They operate with integrated smart sensors that automatically deploy the power step 8" when the door opens. That's up to 15" below the doorsill, depending on the application. The main housing offers an additional non-skid stepping surface on top, providing easy, two-step entry and exit. 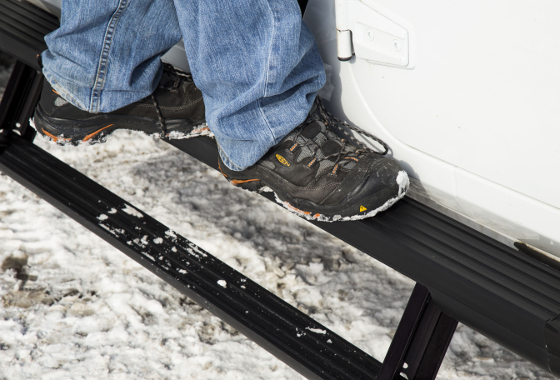 This is especially useful out on the trails on larger, lifted trucks and Jeeps. 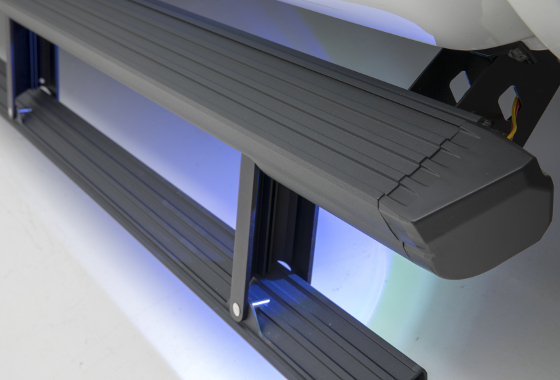 When the door closes, the power step is retracted and concealed within the housing for a sleek, contoured look. The smart sensors also detect any obstructions to avoid damage and pinch hazards. 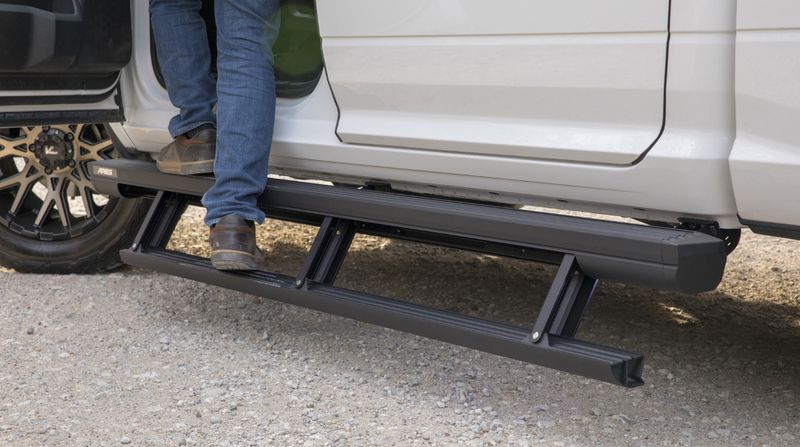 ActionTrac™ powered running boards are also unique in their ease of installation. They mount using pre-existing factory holes, eliminating the need for drilling and reducing installation time. The use of factory mounting points also eliminates the need for alignment on the pivot points and the risk of binding. 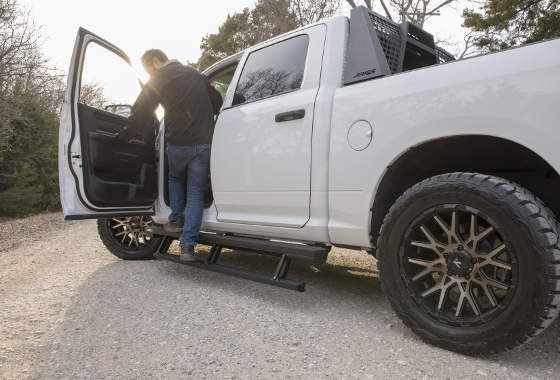 For long-lasting resilience on the road and in the field, ActionTrac™ retractable running boards are constructed from powder-coated aluminum. The aluminum is 6061-T6, making it very durable, lightweight and corrosion-resistant. The housing keeps the power step dry in wet, muddy conditions and seals the internal components off from water, dirt and other off-road debris. The motors within the steps are water-resistant and the wiring harnesses are waterproof. This also makes cleanup very easily. Simply spray them down with a hose and let air dry. 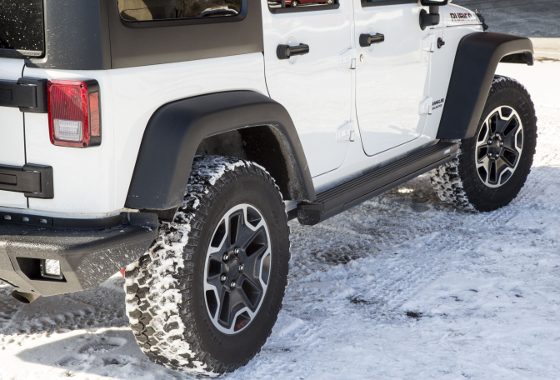 ARIES ActionTrac™ powered running boards are available for the Jeep Wrangler JK and JL, with select applications of pickup trucks and SUVs coming soon. Click here to see a video of the all-new ActionTrac™ powered running boards or to become an ARIES dealer. About CURT Group: CURT Group is a leading sales, marketing, engineering and distribution company of towing products and truck accessories for all types of vehicles, from passenger cars to commercial trucks. Our family of brands includes CURT, ARIES, LUVERNE Truck Equipment, RETRAC and UWS. We are a team of more than 1,000 associates world-wide, with manufacturing plants in Wisconsin, South Dakota, Florida and the Philippines, and 10 regional warehouses across the United States and Canada. We stand for EXCELLENCE in our products and our associates. We aspire to be the industry LEADER by recognizing that the customer is KING and our associates are our greatest ASSET.